The First National Bank of Orwell began as the Farmer’s Bank of Orwell in 1832. It provided financing and clearing services for Vermont’s agricultural boom, largely in the growth of the Merino sheep industry. At that time, the bank building was a large rectangular brick building with arched windows and vaulted ceilings. As many as 22 employees worked at ledgers to accomplish the record keeping. In 1863, President Lincoln signed the National Banking Act to facilitate the issuance of a national currency. 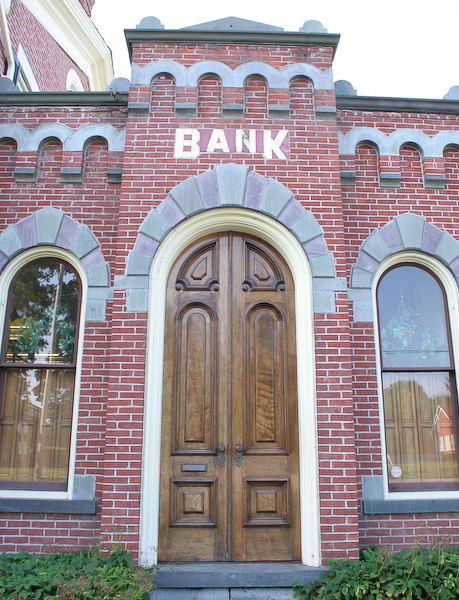 The First National Bank of Orwell was granted charter number 228 under the act and purchased the Farmers Bank for $1300. In the late 1880s, the banking building was completely renovated. The rectangular portion was redesigned to be a five over four colonial home for the bank’s CEO. A wooden addition also contained rooms and servant’s quarters. A small wing built to the west along with half the lower floor of the house contained the banking rooms. Over the door, the word “BANK” in marble letters still describes the function of the building. At the time of the addition, the bank property was adjacent to a large wooden store. The store burned in 1971 and the bank purchased the property for expansion. This expansion came in 1989 with the building of another addition with much needed vault space, parking, offices and data processing facilities. Every effort was made to match the existing bank, including custom-built grill work and mahogany counters.